Lyot Filter Stuff - SolarChat! I have done a bunch of Lyot filter research over the years. Much of it is papers I can't post but I will try to add things to this thread as I find them. Lyot, B.: 1944, AmT. Astrophys. 7, 31. I don't have this one yet. Evans, J. W.: 1949, J. Opt. Soc. Am. 39, 4. Digging through my hard drive with more than 20 years worth of research is time consuming. I am looking for the ATM article that describes making a Lyot filter with optical quartz. This filter could be tuned to both CaK and H-Alpha. If anyone has a reference for it that would be great. I think Dave G. scanned it for me but I can't remember what I named the file. Calcite is the other crystal used. It's advantage is it can be smaller than the quartz version. The disadvantage is the faces are hard to polish because of the fact that calcite is water soluble. A bit like the UBF at the NSO. Given the requirement of thicknesses and orientation of optical axes.... Modding scopes will look like child's play in comparison to Lyot filter making. Keep us posted and LARGE handful of good luck. A colleague build a related device that acted as a hyper spectral camera and it was a real pain to get it working well. I love the piezo tuned elements in that filter. I had heard of them but not seen and assembly. You can also rotate the stages to provide some tuning. The Zeiss UBF worked this way. It s range was about 350nm to 700nm at less than .1A. I think there is still one in operation in the US. 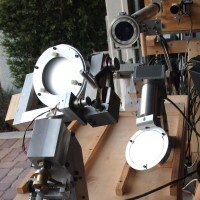 A unique instrument at the focus of the Dunn Solar Telescope is the Universal Birefringent Filter, or UBF. (There are only three other similar filters in the world.) It can be tuned to look at any particular visible color in the Sun's spectrum. A picture can then be taken of that region of the sun. This allows scientists to observe different altitudes and temperatures on the sun, as each chemical element emits or absorbs its own color of light. There are two articles published in Telescope Making on their construction, a 7 part series in Sky and Telescope in 1951 by the famous solar astronomer Richard Dunn on how he made his and one in 1958 by Walter Semerau. I know of no commerical available units. The unit made by Dr Henry Paul is on display in the Stellafane Museum. If one wished to construct one, it would easier then before since you could start off with a narrow band interference filter which would greatly reduce the number of waveplates needed. Maybe only 3 to 5 would be required to achieve a subangstrom bandwidth instead of 12 or more. This is a modern ATM Lyot filter. My German is not very good but I can read some of the details. Click on Instrument. Now that narrow band filters are cheaper you only need 2 or 3 crystal plates as long as the enterance beam is filtered to a few nm. So 40mm diameter crystals will allow us to use a 127mm diameter scope for full disk views. John said that calcite is a calcium carbonate with a hardness of 3. Calcite has perfect cleavage in three directions and is very heat sensitive. He recommended placing the table at the junction of two cleavage planes. John polishes calcite on a wax lap with linde A and is very careful with the lap speed and the pressure. He also recommended keeping the facets small when cutting and polishing calcite. Calcite can also be polished on a chrome oxide Ultralap. The cutting and polishing of calcite must be directional with the cleavage. When I find my old design drawing I'll post them. The thickness of an 1Ang element is 21.7cm for Quartz. Then the next element will be half as thick. So you can see that a quartz filter will be much larger. But you can fine the quartz easier. Now when you cut the crystal you need to cut it on the right axis, hold the axis and polish it to at least 1/10 wave flat on the ends. The advantage of a birefringent filter is that you can change wavelength by rotating one polariod(front or back,depending on the design). I have heard of some Zeiss filters with 32Ang tuning. That's a lot of moving parts. You will get better signal to noise ratio then with an etalon. (An broader filter will have more contrast when compared with an etalon with the same HW. You still will need to have it temperature controlled. Calcite moves blue with heat much faster them Mica ,can't remember what quartz does. The hardest part is to find the optical Calcite that is good enough and large. To make an filter with an 2" CA, and .5Ang element you probably going to start off with a piece 100mmX75mmX75mm. In the papers Colin have posted may have the axis you cut the calcite, if not I'm sure he will find it. We need to get Harald to post here he has some of the most amazing pics which are great for a better understanding of whats going on.Anyone who hasn't visited this site should do so. I do have the optical axis for quartz posted. I have not found the structure for calcite yet. It seems like a 1A etalon and a 1A and .5A calcite element would fit inside your ovens. It seems like getting all elements to tune at the same temperature would be a challange. In order to find the optical axis of any crystal you need to find the angle that rotating the crystal does not move the image of one polarization vs the other. I have a large piece of calcite that is non optical grade. If I can make a drawing I will post it. A very interesting piece of the math shows is that the difference of birefringence of the two axis is termed delta n. The delta n of calcite is -0.172 and the delta n of quartz is only .009! This is why Mark states the thickness of the crystals is so different. Studying this data the new crystal that comes to mind is Lithium Niobate. It would be about twice as thick as Calcite but is commonly lab grown now for lasers in optical qualities. Give Gooch&Housego a call, they stock all sorts of crystals and can cut and polish to order. If you are using narrowband filters to reduce the number of crystal elements needed then this is starting to look practical!